Trogir is a remarkable example of urban continuity. The orthogonal street plan of this island settlement dates back to the Hellenistic period and it was embellished by successive rulers with many fine public and domestic buildings and fortifications. Its beautiful Romanesque churches are complemented by the outstanding Renaissance and Baroque buildings from the Venetian period. Trogir was founded by Greek colonists from the Island of Vis in the 3rd century BC. On this Antique matrix lies the historical core of Trogir, which is the best-preserved Romanesque-Gothic complex not only in the Adriatic but in all of Central Europe. Trogir, set on a small island less than an hour from Split, is one of the most seductive towns on the Dalmatian coast. Its weathered Romanesque and Venetian-Gothic palaces, churches and monasteries fanning from its antique square have put Trogir on the Unesco list of world heritage sites. A stone bridge makes it accessible from the mainland, a mobile bridge connects it with the island of Ciovo. Originally it was a Greek colony. The city was founded in the third century by the Greeks from Syracuse and it was called Tragurion (Goat Island). After Greeks the city was ruled by Romans, Venetians, French, Austrian Italian and Germans. Apart from many interesting architectural and historical sites, Trogir offers a warm climate, lush green surroundings, a number of good restaurants, cafes and bars. Nearest airport is Split from where you can get bus to Trogir. 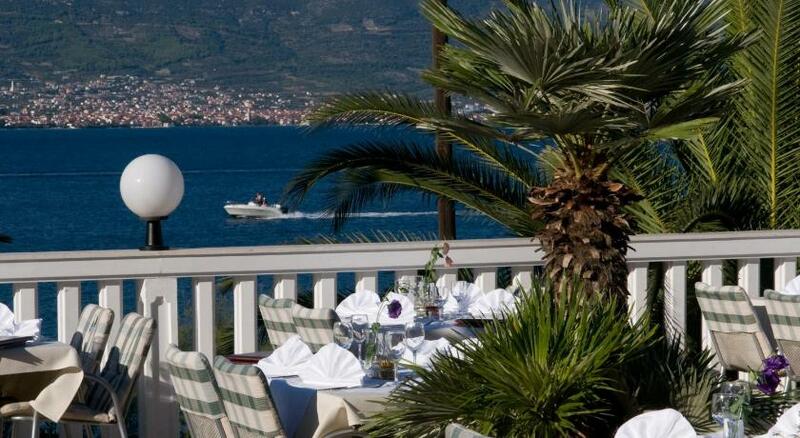 Trogir hotel reservations – Trogir hotels: low rates, no booking fees, no cancellation fees.